Even if you're making homemade food products, be sure to stand out with UPrinting's labels. Our labels can withstand moisture and dampness from refrigeration, so you can be confident your labels will last even on perishable goods. The longevity of your labels means longer exposure for your brand. We have a custom size option available if you're looking for a specific label size. You can print from 25 to 100,000 labels which make them ideal for start-up businesses or commercial food companies. Labels are ready for shipping in as little as 1 business day. Choose convenience. 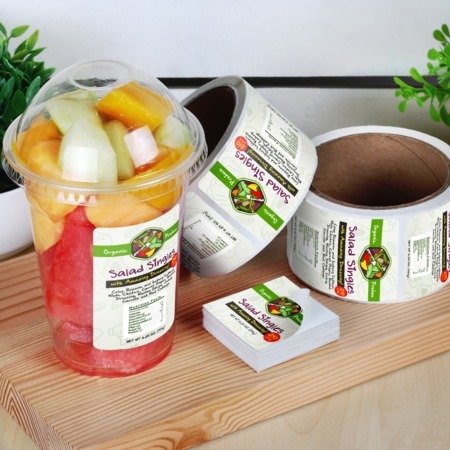 Upload your design and print your custom food label rolls with us. Simply upload your design or use our Online Design Tool to create your labels. We have free file proofing to make sure your products are in great shape before printing.